HERMA Inkjet address labels A4 63.5x38.1 mm white paper matt 525 pcs. HERMA Inkjet address labels A4 88.9x46.6 mm white paper matt 1200 pcs. 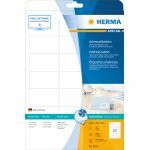 HERMA Inkjet address labels A4 88.9x46.6 mm white paper matt 300 pcs. 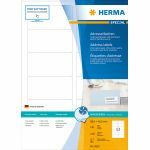 HERMA Inkjet address labels A4 96x139.7 mm white paper matt 400 pcs. 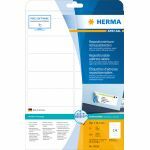 HERMA Repositionable address labels A4 99.1x38.1 mm white Movables paper matt 350 pcs. 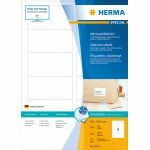 HERMA Repositionable address labels A4 99.1x42.3 mm white Movables paper matt 300 pcs. HERMA Repositionable address labels A4 99.1x67.7 mm white Movables paper matt 200 pcs.